Bhagwati Prasad (b. 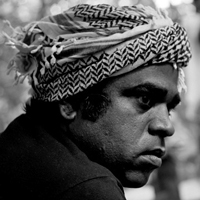 1976, Delhi) is an artist working in performance, graphics and research. He is the author of the graphic book, The Water Cookbook (2010). He started researching popular culture and media life and histories in Delhi, which resulted in him co-authoring Tinker.Solder.Tap (2009), a graphic novel on the history of media piracy in Delhi.